Hiking with others is a good way to learn about the community. When I first came to the Alberni Valley way back in 1985, I was eager to explore the fabled back-country of Vancouver Island. But being new in the community, I had to find like-minded people to show me what was out there and to be hiking companions. 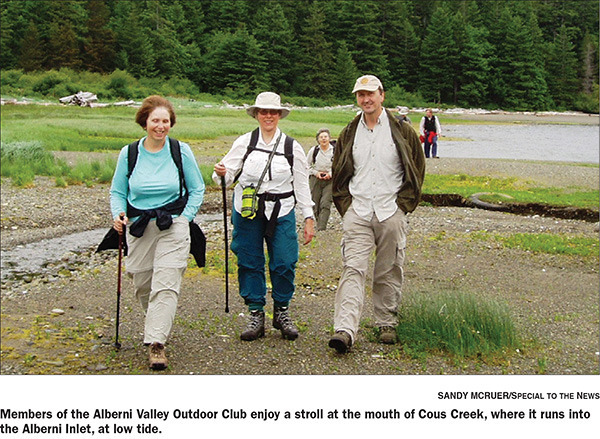 When I found the Alberni Valley Outdoor Club, I knew immediately that here was a treasure of knowledge on local trails. Starting in the 1970s this club has been around for more than 40 years and some of the members have been around from the start and are still going strong. Besides hiking, members have been known to canoe, snowshoe, kayak, and even partake in a little mountaineering and rock-climbing. The club is open to newcomers. And a current trip schedule is posted on their website, albernivalley outdoorclub.wordpress.com. Most of the hikes are day trips. They have a policy of permitting non-members two trips with the club before they have to join. The cost is hardly onerous. It’s $25 each, or for two or a family $45. For this you also become members of the Federation of Mountain Clubs of BC and pay for some liability insurance in case of injury. For safety, the club insists that people contact the trip leader listed on the schedule or amended on the Facebook page if you want to participate in an outing. This way the leader can gauge a person’s experience and recommend appropriate equipment, clothing, and footwear. When you show up you’ll be asked to sign a waiver, but otherwise there is no cost. Low elevation day-trips dominate in the spring and early summer. Coming up in May are hikes to the Sproat Lookout in the Community Forest, a hike down to Cous Creek to see the wildflower show there at that time of year, a snowshoe, ski or hike through a pass between Marion Creek, a tributary to the Kennedy River, and the headwaters of the Effingham River. There is also a canoe/kayak trip through Ash Lake to Dixon Lake. Later in the season, when the snow is mostly gone off the mountains, climbing the local peaks is more popular. Most of them are steep, but don’t require ropes and specialized equipment. Just a bit of scrambling. As things cool off in the late fall, the club generally takes a break for the Thanksgiving and Christmas period before resuming in the new year.